Shared vs VPS vs Dedicated Hosting – What to Choose? Availability: Availability is the time when your applications, services, or system is accessible. Highly available systems have minimal downtime, whether planned or unplanned. For business critical website, it is important to have a minimal downtime environment against a non-critical website. Performance: In a fast moving world, everyone seeks instant information. People tend to move away from a web site if it takes more than 5 seconds to load. Hence it important that performance should be very predictable for those who are planning to host e-commerce solutions or business critical applications. Scalability: Scalability is how well a server can grow to meet increasing business demands. Website and emails are now linked with your business growth and vise-e-versa. With growing dependencies, IT leaders should be able to upgrade their environment whenever the demand arises. Support: Having a right hosting solution without a good support is as good as a hospital without ICU. A good and efficient support team ensures that your website is in safe hands. Security: Web hosting companies have a responsibility to maintain the highest level of security on behalf of their clients. Servers can be vulnerable to attacks by hackers who carry out their work by uploading malware or otherwise malicious code onto a server. Lack of security can be devastating to a business if these problems result in loss of income or identity theft. The bottom line is no company would like to see a hacker’s message when the visitor opens the website. So considering the above needs and facts for a business, let’s now try and understand the differences between the three common web hosting methods. Shared Hosting as name indicates is sharing the resources that are available on the server. This just means that many websites reside on a single server and that the server’s resources (i.e. CPU, RAM, etc.) are shared with other websites. Bloggers, website designers, small e-commerce stores and SME’s benefit from shared hosting as it is convenient, comparatively cheap and cost-effective. All standard features are expected from a web hosting plan are available, however this does not give you flexibility to install the custom software or scripts. VPS stands for Virtual Private server. The overall CPU and Memory of a physical server are split in to smaller private servers. This means that one physical server shares resources virtually but at the same time portions of those resources are always dedicated to each virtual. This allows for more power and flexibility than being on a shared account. VPS utilizes the shared resources of single dedicated server and the VPS owner generally gets the root or administrator access to their own virtual space. Dedicated servers allow you to host only your sites on one server. This means all the server resources are dedicated to your application and no one shares the same. You can control and install applications as needed and can have as much traffic to the web site as the server can handle. Dedicated hosting is ideal for businesses or advanced users who run high traffic websites, CPU-intensive applications, or complex databases. Now that we have understood the basic differences between the three common choices available in web hosting, it would be easy to decide which suits your business needs the best. 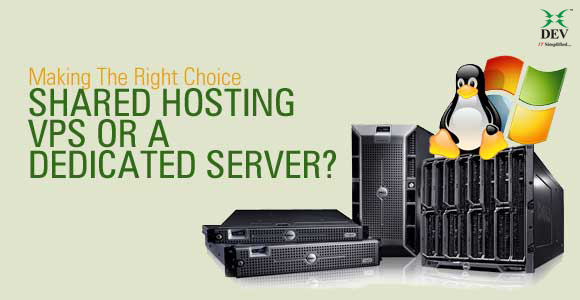 If it’s a basic website you want to host, Shared Web Hosting is your choice. If you have multiple websites which require better performance, Virtual Private Server is what you need. Custom application with high security and super fast performance on the other had demand a Dedicated Web Hosting Server. IT Operations Manager at Dev Information Technology Ltd. I bring over 15 years of experience in the field of IT Management and IT Infrastructure Operations. As the IT Operations Manager, I am responsible for maturing the operational processes to align the service delivery aspects of the company with the ITIL framework and to further improve client satisfaction. It’s an amazing article for all tҺe internet viewers and tҺey will get advantage fгom it – which I am suгe.